What was your background before yoga? Well, if we’re speaking about yoga in its truest sense, I think that state of higher consciousness is present within us before we even come into our physical bodies, as we choose our soul's purpose for this incarnation while still in another realm. Once we “arrive" into this form, it's all about remembering and seeking; a lifelong pursuit to once again know and fulfill that truth, and reconnect with the divine, universal consciousness. We come from, and return to, the source. If yoga is indeed this union, it has been a part of my path from the very beginning of this life, and perhaps many lifetimes before. Who knows when the journey began. My belief is that we are born into certain families for a reason, based on our past karma, and this provides us with the opportunities needed to pursue and advance our goals, spiritual or otherwise. It is up to us to embrace these relationships and allow them to teach us the lessons that we need to learn to move forward, as we work through the karmas that we have accumulated. ​So, to try to answer your question, I’ll start with a little bit about my familial background. My parents immigrated to the United States from India in 1970. My dad, a chemical engineer, wanted to attend MIT for his graduate studies. Like many others, he and my mom left their families and the comforts of home to seek out greater opportunities. My sister and I were born in the United States. Being first generation Indian Americans, our parents pushed us pretty hard in academics. As children, my sister and I would wake up at 7 am on weekends to learn advanced math and science with my dad. We would sit on the floor of the living room with notebooks in our laps for hours at a time (I recall my dad would be seated in padmasana or half padmasana), working out complex problems that my dad would assign us. No bathroom breaks. No food breaks. He was pretty militant when it came to studies. I guess this was one of my earliest experiences of tapas. I grew up in an environment of svadhyaya and Ishvara pranidhana. Raised in a Hindu household, my mom had me learning the Bhagavad Gita, Mahabharata, Ramayana and other scriptures from an early age. We went to the Hindu temples regularly on weekends, and my mom did daily puja at home in the morning and evening, along with daily japa and reading of shastras. I learned a lot about bhakti from her. This was my first impression of yoga, as a path of devotion to God. As an Indian practitioner, are there certain experiences that strengthened your beliefs and connection to Mother India and her culture while growing up? Yes, we went to India every summer throughout our childhood and into our teenage years to be with our grandparents and extended family. In Deoghar, the small town where we would spend a good part of our summer with my mom’s family, everyone commenced the day with the same morning ritual—my grandmother, grandfather, aunts and uncles—each would first bathe then proceed to the puja room to do their morning puja and japa. I would sit and listen as they recited aartis and prayers each day. I loved the sweet prasad my grandparents would share with me after their offerings were complete. Then again in the evenings, puja would be done before dinner. Occasionally I would accompany my uncle to his shop, and there too, before he opened for business each day he would do puja. On auspicious days we would all go to the temple first thing in the morning. Some nights we would all sit together after dinner to sing beautiful melodious bhajans (devotional songs). Bhakti was a big part of everyday life. ​I learned Hindi at a very young age while simultaneously learning English, sometimes mixing up the two in half-English, half-Hindi sentences. 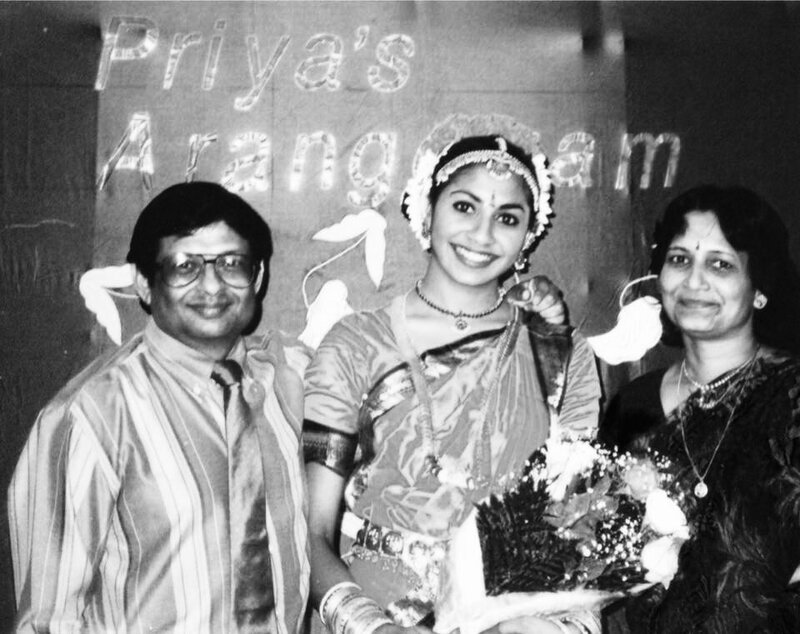 Early on I developed a fondness for Indian music and dance, and began learning Bharatanatyam, a form of classical Indian dance, at the age of seven. Like other classical pursuits, Bharatanatyam is taught under the tutelage of a guru. We would commence and conclude each practice with Namaskaram, offering salutations to Lord Nataraj, our guru, and to Matri Bhumi (Mother Earth), requesting her permission and forgiveness for stamping on her while dancing. These small acts of worship instilled great reverence and highlighted the sacred nature of the practice. Dance was not for mere performance and entertainment. Above all else, it was a sadhana. In retrospect, the years of training, discipline and devotion cultivated tapas. Upon mastery in the various dances, when the guru believes the student is ready, the dancer performs her first public performance, known as an Arangetram. It is a rigorous, three hour, solo performance, and is as much a test of the guru’s teachings as it is a test of the dancer’s skill and training. I recall months of daily 3-hour-long practices with my Guru after school leading up to my Arangetram. It required much stamina and endurance, but most importantly grace, love and sincerity. One must manifest the Divine in the human form, going beyond a superficial performance to awaken to its essence and inner meaning. I completed my Arangetram and received my certification in Bharatanatyam towards the end of my junior year in high school. It is a momentous achievement for every dancer, signifying the guru’s blessing for the student to enter the ranks of this sacred art and be able to teach other aspiring dancers. Tapas, svadhyaya, Ishvara pranidhana. As the Sutras say, these are the kriyas, or actions, of yoga. I didn’t come to associate asana with yoga practice until years later. Can you share more of your perspective on Indian philosophy? I find that all the systems of ancient Indian philosophy have one goal in mind: liberation of the soul from samsara, the cycle of birth and death, leading to union with the Divine. As a child, I saw bhakti as yoga and a path to liberation. As I grew older, I started to question whether the beliefs I had been raised with were truly my own, or simply what I had been taught. While my mother had instilled in me great faith, my father, the engineer, impressed upon me the importance of scientific investigation and objective, analytical thinking. Scientists do not ask you to simply believe; they hypothesize, conduct research and draw conclusions. The truth or fallacy of the conclusions are evident from the results. On his path to becoming a chemical engineer, my dad spent a significant amount of time learning math, physics and chemistry, applying known principles in experimental situations to further his understanding. Likewise, I thought, in order to progress along the path of yoga and Self-realization, one should conduct research that inquires into the nature of the Self, and so I sought to gain further knowledge based upon my own experience and investigation. “Who am I?” “Why am I here?” These questions led me along the path of karma yoga and raja yoga. Karma yoga: the yoga of action. If what we are now is a result of our own past actions, then it follows that all we wish to be in the future can be manifested by our present actions. Thus, how we act now is very important. Hinduism teaches that there are four stages of life to which certain duties attach, beginning with that of a student; then one marries and becomes a householder; in old age, one retires; and in the last stage of life, one gives up the world and becomes a Sannyasin. No stage is considered superior to another, each comes with its own set of duties. The life of a married man or woman is no less important than that of a Sannyasin; the householder marries and carries on his or her personal, familial and social responsibilities as a citizen, while the duty of the Sannyasin is to wholly worship God in an effort to attain moksha, release from the cycle of samsara. Looking back now on my life as a student, this stage was so simple and carefree. My main responsibility through all those years was to learn well and excel in my studies. Twenty-five years as a student culminated in my matriculation from law school. I left Boston and began my career in business litigation with a well known law firm in Houston. It was my dream job at the time. The following year, Darshan finished up with medical school and joined me in Houston, matching at Baylor for Anesthesiology. We were pretty well set, and ready to begin our lives as householders. Our parents were proud. We were living the American dream. And then with a little twist of fate, everything changed. Can you please share what happened? In 2005, my father got diagnosed with a rare type of cancer. It came as quite a shock. In the coming months, as my father’s health started to decline, Darshan and I got married. My dad passed away some months later. It turned our world upside down. All around us, everyone else’s lives seemed to go on unaffected, but ours had been changed forever. Having lost his own father to a heart attack when he was quite young, Darshan was catalyzed by my dad’s passing. It weighed heavily on him. He suggested we take some extended time off to reconsider our life goals and the direction we were headed in. At first I thought it was a crazy idea. What good would that do? Moreover, how could I leave my job with a top firm where I was headed to become a partner, and that too at a time when lawyers were struggling to find jobs? And for Darshan to leave his Anesthesiology Residency at Baylor, the program which was his top choice, he could be blacklisted from returning to any residency program. It was a scary decision to make and required a huge leap of faith. After much consideration, we decided to take the leap. We had savings that could support us for awhile, and figured even if it ended up being the wrong decision we would bounce back from it. At the conclusion of Darshan’s year of residency, leaving behind our fears and the security of our jobs, we moved to Austin to spend quality time with my family. For about a year we worked on a healthcare start-up together with my sister and brother-in-law, wanting to keep ourselves motivated and intellectually stimulated, but I felt lost for quite some time. Letting go of my identity as a lawyer left me unsure of what my purpose was anymore. Fortunately, I had an asana practice that I had begun while in law school in 2001. The grounding ritual of this practice helped to ease some of my discomfort through this time, as did the joy of being around family, especially my sweet young nieces; however, the yearning to find myself again, to know my true calling, steadily grew stronger. Working on the start-up was a good learning experience but after a year we decided to fold it. Darshan and I spent a good part of the next year traveling. We went back to India for the first time in many years, as the pressures of college, graduate school and work had left us little free time to take such trips as we had growing up. It was also the first time for me to return to India since my father had passed away, and the first time for Darshan and I to go to India together as a married couple. It was a very different experience to be there visiting our extended families on our own, as adults, without our parents. And we now had twice as much family to visit. Being the eldest son, my dad had always made it a point to stay in close touch with all our relatives and made at a least a yearly trip to India to visit both his and my mom’s families. Maintaining familial relationships was something he enjoyed thoroughly, but also something he considered a duty, especially with his elders. Being back in India and visiting my relatives without him was an emotional experience, yet also a healing one. I felt my dad would be proud to know that we were carrying on these duties and maintaining important family ties in his absence. It made me feel whole and reconnected to my roots. After six weeks in India, we returned back to the U.S. and soon after took off to volunteer on a medical mission in Guatemala. While working to provide care to the indigent populations there with a bunch of doctors and residents from around the States, Darshan was “recruited” back into residency. The director of a family practice program in Dallas who was also there volunteering invited him to come and interview with their program. After the medical mission, Darshan felt realigned with his purpose for entering medicine: to help people heal and live healthier lives. The program in Dallas turned out to be a great fit for him. Two months later we packed up and were on our way there as he once again entered back into residency training. My firm had left their door open for me to return as well, but I resisted the urge to jump back into the corporate world and resume our old way of life. Darshan encouraged me to delve deeper into my yoga practice, knowing how much contentment and steadiness it provided. I dreamt of going to study in Mysore but didn’t feel like it was an option for me at this point. I could only imagine what our families would say—the dismay and scrutiny that would be forthcoming at my suggestion of traveling to India for such an extended period of time, to a place where none of my relatives resided, and that too to study yoga! I could already anticipate the probing questions that would be asked about the future of my law career, questions which I was not ready to answer. Instead, I decided to take some time to go and study with Caroline Klebl, who had studied with Sri K. Pattabhi Jois in Mysore over many years. It was in the setting of a "teacher training". At the time, I had no personal reservations about this and was not aware of Sharath ji’s views about teacher trainings either. In fact, most senior western teachers I had studied with until that time were regularly running some sort of teacher training or intensive. I didn’t know if I would set out to teach in the future, but the idea of immersing into my own practice was appealing. Along with morning Mysore practice, we delved into daily sitting practice, chanting of the Yoga Sutras and study of yoga philosophy. I continued to study with Caroline over the next couple years and at her suggestion, began to assist and teach while continuing to do contract law work. Though I had a positive experience, I feel differently about teacher trainings now and understand Sharath ji’s reasons for disapproving of them. I’m thankful that my path ultimately led me to Mysore. After Darshan completed residency, I convinced him to take the following year off. In July 2012, upon his graduation, we left Dallas and moved all our things into a storage unit in Austin. We spent some time with our families and the following month we departed for South America. Four months mountaineering through the Andes, followed by four months visiting our extended families and traveling through India; then on to Australia, New Zealand, Thailand and Nepal for the remainder of the year. We traveled freely—spending time with family and friends, spending time in nature, reconnecting with ourselves and tuning into our higher purpose. We practiced our yoga wherever we went. Meeting long-time Ashtanga practitioners and teachers around the world who had been going to KPJAYI for years had a profound impact on me. They encouraged me to go and experience Mysore for myself. Upon returning to the States after our year abroad, we felt reinvigorated and clear about our path ahead. Darshan decided to pursue a fellowship in Integrative and Holistic Medicine and I decided it was time for me to go to Mysore. My first application to study at KPJAYI with Sharath ji for the fall of 2013 got rejected. I reapplied and got accepted to study with him for three months starting in January 2014. Since then, I have continued to return regularly. How did you first find the practice? The law firm I worked for in Houston paid for our memberships at a prestigious club downtown, where all the lawyers worked out and lunched with clients. A guy named Erik was teaching Ashtanga classes at lunchtime, and I would attend those as much as my schedule would allow. That’s where I first encountered Ashtanga Yoga back in 2004. The beautiful thing is—in June of this past year while in New York for Sharath ji’s workshop, I ran into Erik again after nearly a decade or so! He is still living in Houston and now married to my friend, Rachel, and together they run their own shala, Ashtanga Yoga Houston. I love how interconnected our Ashtanga community is. You mentioned the pressures of your family not understanding your desire to go back to India to study yoga (away from any local family of all things!). Do you think there will be an acceptance of yoga as a personal/professional calling with our generation vs. our parents’ (from an Indian perspective)? Yes, I believe there can be, and I’m happy to say that I have experienced such acceptance and support by not only my parents’ generation but even their parents’ generation. It all lies in understanding and respecting each other’s values. Being a first-generation Indian American, my experiences and values differ in some ways from those of my parents. I can appreciate the struggles and hardships that my parents must have faced, immigrating to this country with no familial, social or financial support, having to adapt to an entirely new culture with different customs, language, food and a different way of living, all while trying to build a life and career from the ground up. To say that it must have been challenging is a serious understatement. They came here for opportunities that were not available to them in India. I deeply admire and respect their courage, grit and perseverance, and am so grateful for all their hard work and determination to succeed in their pursuits and provide for us as a family. They impressed upon us the importance of these values and strong work ethic in hopes that we too would achieve great success in this land of opportunity and live even better lives than they did. But therein lies the question: what makes a "good life”? 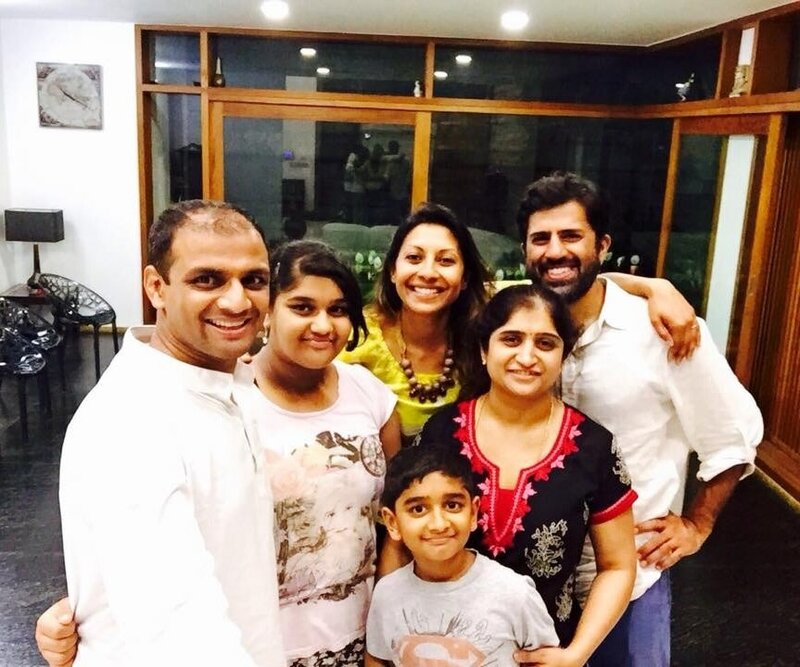 Ingrained in us from a young age by our parents’ experiences and expectations, Darshan and I grew up believing that high-powered careers and financial success would make for a good and happy life, one that would provide us with the comforts to live well and raise a family with ease. However, along the way we realized that our happiness was actually dependent on many other things—the relationships that we foster, the community that we cultivate, finding balance and living harmoniously with nature and the world around us, enriching ourselves through continued learning and exploration of the world we live in and its diverse places/people/cultures, etc. In actuality, yoga has taught me that happiness isn’t what I’m seeking in the end; it’s equanimity and the ability to go through life and all that it presents with more ease, in times of joy, sorrow and everything in between. Yoga has given me this clarity and enabled me to live my life more purposefully. Reflecting on all this and sharing it with our families took some time. As I became more clear about my calling, it became easier to share without the fear of judgment and scrutiny. We are very fortunate that our moms and siblings supported us in our desires to pursue alternative paths when we made the decision to do so. Having experienced such great loss together (the passing of our dads), they understood our difficulty in continuing on with our busy work-centric lives as though nothing had changed. When the time came to share with others—our extended families, friends and colleagues—some opened their hearts to listen and understand where we were coming from and why our perspective had shifted, while others perhaps judged us and simply thought we were being young and foolish to leave our careers like we did. I recall my dad’s sister pulling me aside at a big family wedding in India a few years ago, wanting to have a serious talk with me about yoga and understand my interest in it. We had several deep and meaningful conversations about what yoga means to me and the impact it has had in my life as a spiritual practice. She was very happy to know that it was more than just a fad taken up in the west based on some superficial interest, but rather a sincere desire to go deeper into myself. We spoke of the Gita at length, and how she too was spending most of her time engaged in svadhyaya in her old age, seeking to know her true Self and to know God more fully. I had a similar experience in speaking with my dad’s eldest sister, who acknowledged how unusual it was to leave behind a budding career and change course like this, but told me how proud she was that I was embracing the path of yoga at such a young age rather than waiting for the “end years" to know it. Most recently, we went to visit my dad’s uncle in Rishikesh, the oldest living member on his side of the family, formerly a Sanskrit professor in Banaras for many years who now in his old age has retired to an ashram and is living out the “Sannyasin” stage of life. It was beautiful to connect and be able to share with him a little bit about my experience on this path of yoga so far. While he was surprised to learn of the choice I had made with respect to my career, he was very pleased to know that living in the west, I had not lost my connection to our culture and heritage, and that this deep interest in yoga was bringing me back to India to study in earnest with my Guru in Mysore. A more challenging conversation took place when I went to go volunteer with an anti-trafficking organization in India to teach yoga to young girls and women who had been rescued from brothels. This kind of work is often looked down upon by families of higher castes, as there is much social stigma and shame associated with interacting with these groups of women; even discussing them and their circumstances is considered taboo. The caste system in India has historically been used to the exclusion of certain groups, and it has even legitimized ritualized prostitution on lower caste groups. When I accepted the opportunity to go and work with these women, my mom asked me what I would tell my grandmother about what I was doing in Hyderabad. Despite being worried about how she might react and disapprove, I told my mom I would tell her the truth and explain my desire to share yoga as a healing practice for all. Conservative as she is, my grandmother was able to put aside her traditional notions of caste and appreciate the value of serving these women. So even my grandparents’ generation has come to not only accept my decision to pursue yoga as a personal and professional calling, but to respect it and regard it with esteem. When we share from the heart with those who take the time to listen intently, it opens up the possibility for understanding and acceptance. For me, teaching yoga has been such a privilege because I see in it the opportunity to serve others and see its healing potential on people from all walks of life. It is without a doubt a worthy calling, and embracing it both personally and professionally has been very fulfilling. What was your experience meeting and practicing with Sharath? How has he affected you as his student? I was nervous and excited when I finally arrived in Mysore to study with Sharath ji and experience the teachings of Ashtanga Yoga directly at their source. From my very first practice in the Shala with Sharath ji, I had a very strong feeling that he was my Guru. His energy and the energy of the Shala were quite palpable. It was unlike what I had ever experienced practicing anywhere else. Though it had been over a decade since I had begun practicing Ashtanga Yoga, I knew that I was meant to be there at that time. Having always been of strong mind and opinion, for me the idea of "surrendering" to another has never come easy. But with Sharath ji there was a deep trust and connection. I felt like he knew me before we ever even exchanged much in the way of words. In western culture, the idea of surrendering ourselves to someone else is thought to be foolish and disempowering. We do not readily submit to others. However, in eastern culture, this idea of surrendering oneself, and surrendering one’s fears, is what allows us to transcend our perceived limitations and gain true spiritual wisdom. It is essential in any true guru-shishya relationship, and at the heart of any lineage based on parampara. Traditionally when a guru took on a student, this meant taking on the student’s karma as well, and accepting responsibility for their spiritual evolution and progress. The relationship of guru and shishya is not one which is taken lightly. It is entered into with a sense of great commitment and responsibility. Sharath ji has never proclaimed himself as a guru to me, but having accepted me as his student, I feel a great reverence and responsibility towards him and the lineage. While there is a mutual love and respect that develops between guru and shishya over time, a guru is also very strict. If you’ve read Paramahansa Yogananda’s "Autobiography of a Yogi” or any number of other accounts by disciples that have described their relationship with their gurus, these relationships have traditionally been quite intense. Gurus are usually quite hard on their disciples, testing their patience, commitment and perseverance for quite some time. In Indian culture, we even tend to be fearful of our gurus. They do not give us the satisfaction of praise and recognition, but rather keep trying to instill within us the desire to do better. My father was much like this. Back in school, even when I came home with a 4.67 GPA, he didn’t say “good job” but asked why I didn’t have a 5.0. I have found my relationship with Sharath ji to be like this as well. In particularly difficult asanas, he wouldn’t give me a nod of approval until he saw it perfected. For example, when lifting up from Karandavasana, if I wasn’t perfectly back up into Pincha Mayurasana first he would shake his head at me and ask why I was jumping back so soon. At the time I felt that perhaps he was being harder on me because I am Indian. Later I came to realize that he saw my potential in the posture, and he waited to progress me in my practice until I had reached it. Though he is tough on his students, he also cares deeply about their wellbeing. One time when I went to get an Ayurvedic massage, for some reason my knee completely swelled up afterwards. I couldn’t walk on my right leg or put any weight on it for a day or two. When I returned to practice a couple days later, he called me into his office to see how I was feeling and find out what had happened. He cautioned me to take it easy in my practice that day to make sure I didn’t do any postures that would aggravate it. Under such circumstances, he did not hesitate to express his care and concern. And then there have been times when he is just downright funny. I remember one day in the Shala when someone in the row in front of me kicked up into Pincha Mayurasana and kicked my friend who was practicing right behind him in the face! It was like a loud slap heard ‘round the Shala. Seeing that my friend was okay and just a little stunned, we all started giggling. Sharath ji looked over from across the room as well, and as he smiled he jokingly yelled, “Hey, no karate in the Shala!” The memory still makes me laugh out loud. He likes to have a good time, and it was nice to see him sharing a laugh with everyone. While on retreat together in Uttarkashi year before last, Darshan and I were speaking with Saraswathi ji at the front of the room after finishing our practice before the next class was about to begin, when Sharath ji came in and suddenly called everyone to Samastitihi in a loud, projecting voice. Darshan and I hastily got up to leave, worried we had stayed around too long. We turned around to see Sharath ji laughing at us, as he saw the look of fright on our faces. He enjoyed giving us a little scare, as there was still another fifteen minutes before he was going to begin the next class. Seeing him in this playful and humorous light reminds me that he is human, and just like us, he likes to have fun. Everyone is just human and doing their best. And personally, I think he’s doing a wonderful job and is a great role model. It is humbling to witness his dedication and tireless commitment to the practice and to teaching hundreds of students daily. He wakes up at 1 am to do his own practice before teaching for 8+ hours a day, then comes home to eat the same, simple meal he routinely takes before a nap. He then heads back to the Shala in the afternoon for office hours, spending time with his family in the evenings before retiring to bed and starting the day all over again. That is tapas. I have observed him treating everyone that comes to practice equally, without passing any judgment. Even when I, myself, have felt embarrassed or bothered by what I have seen people wearing in the Shala, their manner of addressing him, or the questions that are occasionally asked during Conference, he seems equanimous as he remains grounded in the yamas and niyamas. Seeing the immense love that he carries for his grandfather and all that he does to uphold his teachings is heartwarming. He sets an example by the way he lives, integrating yoga into his daily life while leading the life of a householder, rather than separating it from his responsibilities as a son, a father and a husband. Shruthi, too, is such an important source of strength and support so that he can continue to do what he does with love and devotion. Anyone who runs even a small traditional shala and has a family knows how important their support is, as it takes much sacrifice and commitment to a certain way of life. I know I wouldn’t be able to do what I do without a partner like Darshan. At the end of the day, we all need support for the things that we do. I am blessed to have such support from my family, Guru and community. What is the magic of Mysore? It is indescribable really. You cannot put true spiritual experiences into words; it only diminishes them. That’s why spiritual masters don’t speak about their experiences or talk about their sadhana. In an effort to answer your question, however, I would say the magic of being in Mysore comes from a deep connection to Guru, to this practice and to the lineage. It is the experience of parampara and further cultivating one’s sadhana. When we practice in the Shala in Mysore, a certain energy permeates the space that is almost tangible. As we chant the opening mantra together each morning, it feels as though we are invoking all the wisdom and energy of our teachers and ancestors that have passed the yogic traditions down to us. Tapping into this is very powerful. ​Community also plays an important part of the experience. Connecting with other like-minded practitioners whom we meet on our path, who perhaps have made similar choices in their way of life, is often inspiring and reassuring of the decisions we have made. It can also be easy, however, for students to isolate themselves in our little “yoga village” without really getting acquainted or interacting with the local community, making one feel more like a yoga tourist. Part of the beauty of being in Mysore is connecting with the local community—friends and neighbors who become an extension of our family while there. During my first trip to study in Mysore I lived in an apartment building about a twenty minute walk away from the Shala where mostly elderly Indians and some families resided. My neighbor, whom I referred to as “Uncle” (as it is customary to refer to all elderly Indians respectfully as “Auntie” or “Uncle,” regardless of any actual relation), was an older man in his 80’s whom I would have chai with regularly after practice. He himself apparently studied yoga for a few years with Krishnamacharya as a young boy, along with Pattabhi Jois. I loved hearing stories of his life and family, and he too looked forward to the time of sitting and sharing with me. This, to me, is what completes the experience of yoga: cultivating a deep connection not only to ourselves but with our families, communities and the world around us. This practice is not one which asks us to give up our families and communities and retreat to a cave, but rather to connect with them more intimately and live our daily lives with more awareness. It is a path for householders, as Sri K. Pattabhi Jois so lovingly demonstrated, and Sharath ji and Saraswathi ji continue to exemplify. Being with them in Mysore further inspires me to live my life as truly and authentically as I can. Priya, you’ve just given birth to a baby girl, your first. How has that experience impacted your sadhana? In wanting to begin a family, we had some concerns, as we were 37 years old when we decided to start trying last summer. We’ve known many people to have difficulty getting pregnant in their late thirties. However, I did not want us to be guided by fear. That is why we chose to wait for some years until we felt ready to take this big step. So that was a practice in faith. I believed that whatever was meant to be would manifest. As it turned out, we got pregnant within two months of trying. Morning sickness came on with a vengeance six weeks into the pregnancy. The phrase is a misnomer. For me, the nausea and sickness lasted all day and night, with violent vomiting spells. It tested my resolve to continue practicing and teaching; however, I recognized the importance for me to let go of the asana practice during this time. This act of surrendering was the first of many to come. 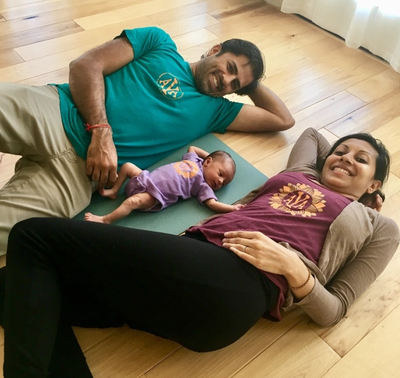 At 20 weeks, as the nausea and vomiting subsided, I was able to resume my asana practice, but did so with a different perspective. I knew that in the coming weeks and months many more changes would be taking place, and that I would have to let go of any prior attachments to the physical aspects of my sadhana. As my pregnancy progressed, I tried to prepare myself mentally and was hopeful for a natural childbirth. When my labor eventually did start a couple weeks before my due date, it came on rapidly with strong and frequent contractions. Because I was having "back labor", Vira's head felt like a sledge hammer to my back with each contraction. The pain was more grueling than anything I have ever experienced. As each hour passed, I wondered how much longer I could endure it. Having undertaken other significant endeavors marked by intense tapas and surrender, I thought I would be reasonably prepared for childbirth, but even these paled in comparison. While mountaineering in the Andes in preparation for an expedition on Mount Aconcagua, I got lost on a high altitude glaciated peak in Ecuador. There on my own in the middle of the night, amidst freezing conditions, I seriously thought I might die. At one point I sat down and made peace with this fact, putting my faith in and surrendering to God’s will. Upon doing so, I was no longer consumed by fear. I put my trust in the mountains and in Mother Nature to lead me to my fate, whatever that may be. My inner voice told me I had to keep going, if not for myself, then for Darshan. Guided by strong will and perseverance, I managed to find my way back to safety. The experience of giving birth to my dear Vira was much like that of being on the mountain, but many times more amplified. Pressing on through 27 hours of intense contractions, at one point I was so exhausted laboring on all fours, Darshan literally held my head up so I could conserve energy between them. My greatest self doubt came during the final hours of labor. The pain felt unbearable and I seriously questioned whether I would be able to continue to push. I relied on the support being offered by my husband, sister, mom and midwife, and listened intently to the words of Ravi Shankar’s “Prabhujee”. In those final moments as Vira’s head began to crown, it was the breath and act of total surrender that enabled me to move past my primal fear of the pain and allowed her to descend. My decision to stay unmedicated and fully present for Vira in mind, body and spirit was what I believed to be the most significant way for me to honor her arrival. This, to me, was particularly fitting, as her name “Vira” means "one who is brave and courageous”. I feel blessed that she was able to enter this world in such a way, while surrounded by so much love and support. When Darshan and I first made the decision to get pregnant, we had conversations about why we wanted to embark on this journey. We agreed that it would be a sacred act to bring a soul into this realm and take on the responsibility of guiding her through life. As I mentioned when we began this interview, I believe life is about remembering and seeking our soul’s purpose; the pursuit to once again know and fulfill our truth, and reconnect with the Divine, universal consciousness. We are born into certain families for a reason, and so Vira has arrived into our family, having chosen us as her parents. Through this relationship, each of our spiritual evolutions continue. To date, bringing Vira into this world has been been my greatest experience of tapas and Ishvara pranidhana, and indeed my greatest sadhana. I suppose I would just like to reiterate how important parampara is. As students and teachers forming links within this lineage, we have a responsibility to uphold the teachings that have been passed down to us. 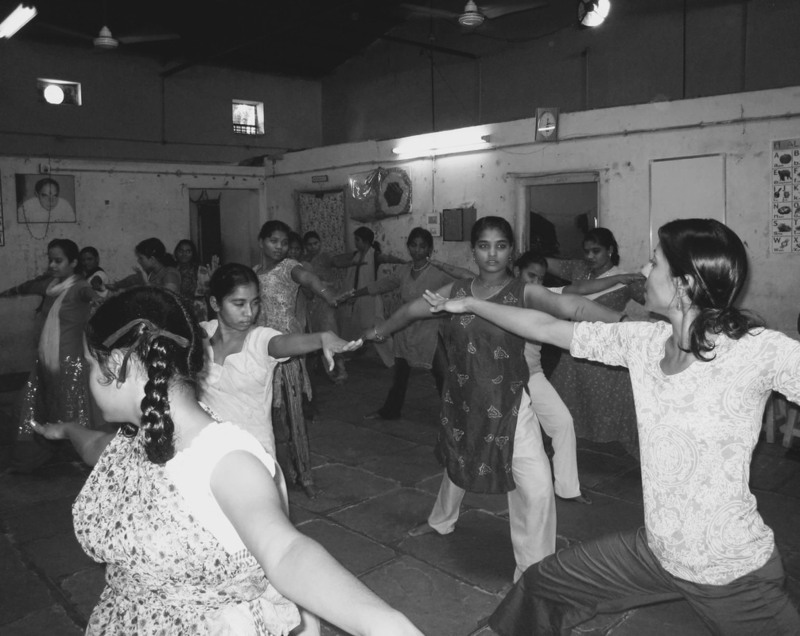 In guiding students, there is much to share beyond the asanas. I believe the most important guidance we can provide is through the example we set for others, in the way that we lead our lives, exemplifying the yamas and niyamas. I want to thank you, Lu, for allowing me to share some of my thoughts and experiences, and for all your patience, hard work and effort in bringing these stories together for our community. May we all continue to honor and realize the beautiful gifts of this practice for years to come.